Pope Benedict gave his last public blessing this week to tens of thousands of people in Saint Peter's Square in the Vatican, the church's administrative center. The resignation of the leader of the worldwide Roman Catholic Church took effect Thursday. On Wednesday, the 85-year-old leader took one final ride through the square in his open vehicle. He stopped at times to bless a baby. Later he told the crowd that he has been through some moments that were "not easy." The pope said, "To love the Church also means having the courage to take difficult decisions." Some observers said the comment was a reply to his surprising decision to resign. Benedict recognized that his decision was not expected. He told Catholic believers that he made the move with what he called "profound serenity of spirit." The most recent papal resignation was almost 600 years ago, when Pope Gregory the Twelfth stepped down. Father Thomas Rosica, the director of a Catholic television network in Canada, was among those listening to Benedict's final address. Father Rosica says the pope's decision to resign is a way of teaching Catholics about surrender. "Pope John Paul II taught us the profound lesson of his papacy, especially in the final years, about suffering and dying. Pope Benedict has taught us another lesson. He's taught us about surrender. We don't cling to power and authority and office and privilege, when our energies are no longer there." Benedict said the Church had troubles and "stormy waters" during his eight-year leadership. But, he said God will not let the institution sink. He urged all Catholics to always put the good of the Catholic Church before their own personal desires. The pope has had to answer accusations of corruption and sexual abuse by Catholic clergy members. He has dealt with the leak of thousands of private documents that reportedly show dishonor in the church. And, there has been a decrease in the Catholic faith within Europe. Before leaving on Thursday, Benedict said goodbye in private to Roman Catholic cardinals. He urged these high-level officials to unite as they prepare to choose the next pope among their number. Pope Benedict will now be called "pope emeritus" and continue to wear the white clothing he wore while serving as pope. Many people have criticized the decision to let him stay in the Vatican. They say his presence could create tension with the new ruling pope. 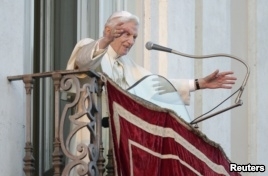 Pope Benedict has said he plans to live quietly in prayer and meditation in his words, "hidden to the world." He also promised to show "unconditional reverence and obedience" to the next pope. The Pope left the Vatican Thursday by helicopter and arrived at his new temporary home, Castel Gandolfo, south of the Vatican. He will return to the Vatican and live in what is called a convent in a few months. In a final message on his official Twitter account, the leader of the world's more than one billion Catholics thanked his followers for their "love and support." He also wrote, "May you always experience the joy that comes from putting Christ at the center of your lives." The explosion of bombs rent the serenity. "The solution of a mystery of this magnitude is totally unpredictable, " said Freeman Dyson, a professor emeritus of physics at Princeton University in New Jersey. I'm sorry to interrupt your meditation.